Azure ATP security alerts explain in clear language and graphics, which suspicious activities were identified on your network and the actors and computers involved in the threats. Alerts are graded for severity, color-coded to make them easy to visually filter, and organized by threat phase. Each alert is designed to help you quickly understand exactly what is happening on your network. Alert evidence lists contain direct links to the involved users and computers, to help make your investigations easy and direct. Official Azure ATP name of the alert. Brief explanation of what happened. Additional relevant information and related data about what happened to help in the investigation process. True positive (TP): A malicious action detected by Azure ATP. Benign true positive (B-TP): An action detected by Azure ATP that is real, but not malicious, such as a penetration test or known activity generated by an approved application. False positive (FP): A false alarm, meaning the activity didn’t happen. How common is this specific security alert in your environment? Was the alert triggered by the same types of computers or users? For example, servers with the same role or users from the same group/department? If the computers or users were similar, you may decide to exclude it to avoid additional future FP alerts. Note: An increase of alerts of the exact same type typically reduces the suspicious/importance level of the alert. For repeated alerts, verify configurations, and use security alert details and definitions to understand exactly what is happening that trigger the repeats. To get more details on a security alert, download the detailed Excel alert report. Click the three dots in the upper right corner of any alert, select Download Details. All involved entities (accounts, computers, and resources) are listed, separated by their role. Source, destination, or attacked, depending on the alert. Accessed Resource: Time, Computer, Name, Details, Type, Service. On attacked accounts when the suspected attack used Brute Force. On Domain Name System (DNS) servers when the suspected attacked involved network mapping reconnaissance (DNS). In each alert, the last tab provides the Related Entities. Related entities are all entities involved in a suspicious activity, without the separation of the “role” they played in the alert. Each entity has two Json files, the Unique Entity Json and Unique Entity Profile Json. Use these two Json files to learn more about the entity and to help you investigate the alert. Includes the data Azure ATP learned from Active Directory about the account. This includes all attributes such as Distinguished Name, SID, LockoutTime, and *PasswordExpiryTime. For user accounts, includes data such as Department, Mail, and PhoneNumber. For computer accounts, includes data such as OperatingSystem, IsDomainController, and *DnsName. Includes all data Azure ATP profiled on the entity. Azure ATP uses the network and event activities captured to learn about the environment's users and computers. Azure ATP profiles relevant information per entity. This information contributes Azure ATP's threat identification capabilities. How can I use Azure ATP information in an investigation? Investigations can be as detailed as needed. Here are some ideas of ways to investigate using the data provided by Azure ATP. Check if all related users belong to the same group or department? Do related users share resources, applications, or computers? Is an account active even though its PasswordExpiryTime already passed? Azure ATP detection capabilities rely on active Network Name Resolution (NNR) to resolve IPs to computers in your organization. Using NNR, Azure ATP is able to correlate between raw activities (containing IP addresses), and the relevant computers involved in each activity. 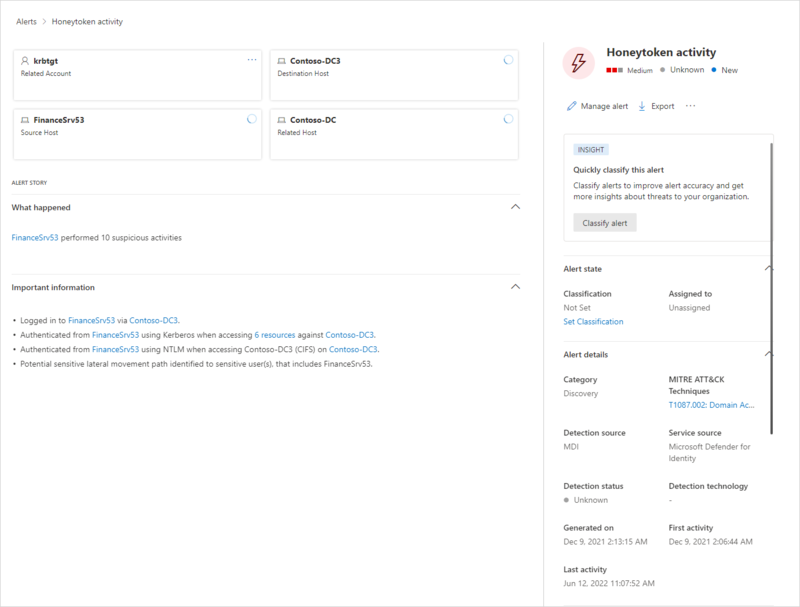 Based on the raw activities, Azure ATP profiles entities, including computers, and generates alerts. Use the NNR information provided in the Network Activities tab of the alert download report, to determine if an alert is an FP. In cases of an FP alert, it's common to have the NNR certainty result given with low confidence. Certainty – low-resolution certainty may indicate incorrect name resolution. Resolution method – provides the NNR methods used to resolve the IP to computer in the organization. For more information about how to work with Azure ATP security alerts, see Working with security alerts.